Beaming Baby Bio-Degradable Nappies Small Newborn, Size 0 Case of 4 160 nappies Bulk Buy Savings! Beaming Baby Bio-Degradable Diapers Small Newborn (Size 0) Case of 4 (160 Diapers) Bulk Buy Savings! Click for more details about Beaming Baby Bio-Degradable Diapers Small Newborn (Size 0) Case of 4 (160 Diapers) Bulk Buy Savings! They form a Naturally Breathable Layer against Your Baby's skin; the top sheet is made with Natural Cotton and Cornstarch Fibers. 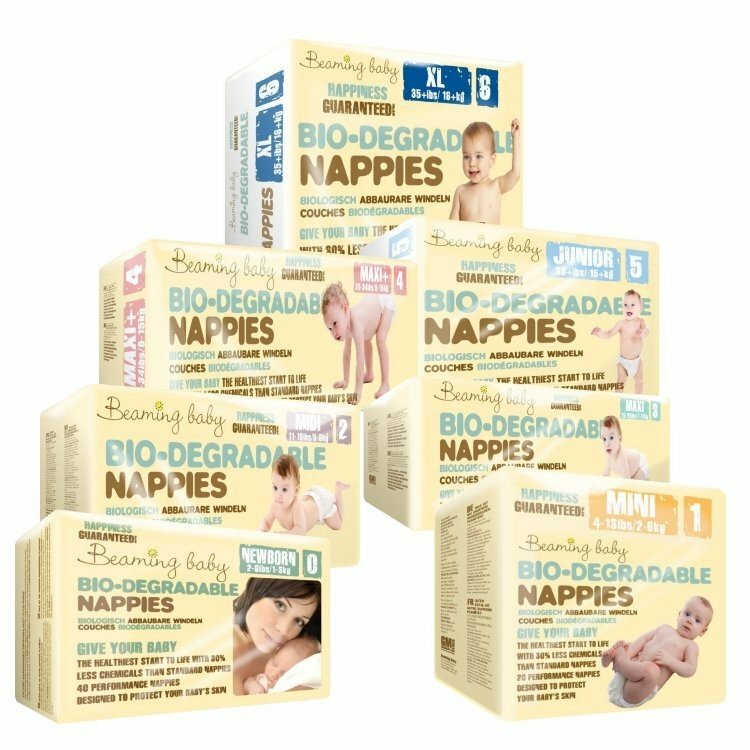 Not only are these great in terms of eco friendliness, but my baby is now just over a month and has not once had diaper rash! Happy days. I live in Kenya and am very eco-conscious, but need to buy in bulk each time. Have seen yr diapers biodegrade almost completely on my compost heap after two years. We have been so pleased with your diapers.The diapers we had been previously using (Pampers Activefit)we always had to apply lots of diaper cream, as our daughter suffered badly from diaper rash. However when we used Beaming Baby diapers I needed no cream and there was no diaper rash. Thank you. When I'm not using cloth diapers, I have used bambo and nature baby diapers and also pampers, huggies etc. Have recently discovered beaming baby diapers and I think they are the best, they don't leak (so far) they feel, look and smell nice, and are far far better than pampers in every way. The diapers are very good & performed without problems - no poo or wee leaks unless the diaper was very full indeed. The price is good, too. However, as you get a lot of diapers in the bulk pack you should consider whether your baby is likely to grow out of this size while you still have some left. A great product which is a bit more absorbent than standard diapers. That said, the "up to 12 hours" suggestion is far fetched-I tested this and my 4kg son had wet clothes by 9 hours! They smell great and aren't that much more ££ than standard diapers. Great to complement the reusables! You're reviewing: Beaming Baby Bio-Degradable Diapers Small Newborn (Size 0) Case of 4 (160 Diapers) Bulk Buy Savings!